I’m blessed to live within easy reach of the ocean, and it’s to the beach I go to bulk up on the greenest of green for my pile, seaweed. Onion blight, along with the invention of modern food production and preservation technologies, did away with the farming of onions in the loamy, sandy fields here in coastal southern Connecticut, which gave way to second-growth woodland and tracts of suburban housing, ranging from gilded manor and weekend New York retreat to postwar cape and modern McMansion. My one-story, two-bedroom cottage was built in the early 1950s and sits squarely in the center of a flat, one-third-acre corner lot of coastal marshland long ago dredged and drained into farm fields for those onions and later filled in to develop as postwar housing. Driving to work or errands along the narrow, winding road my house sits on, each day I pass by two old onion barns. The smaller was long ago converted into a house; the larger, two-story wood structure tucked into the side of a hill, is still pretty much a barn and now used as what looks like a pool house for the modern home it sits behind. My home is just a mile or so away from several public beaches strung along the northern shore of Long Island Sound in a collection of rocky coves, sandy beaches and tidal-river marshland. I drive to one of the local public beaches often in the fall, with the dog sniffing sea breezes out the side window and a washtub-size plastic bucket in the back cargo space of my SUV. My dog and I both prefer low tide — him for chasing a tennis ball over the tidal flats and me for searching out the easiest pickings of washed-up seaweed and salt marsh grass. Gathering seaweed in the fall at a local beach. Depending on the season, the weather and the wind, high tide usually leaves a long scraggly line of flotsam, most of it a motley salad of different kinds of seaweed and scraggly reeds of salt marsh grass turned to hay. The wrack line, they call it. Today’s catch was good; a recent storm had pushed up a dense patch of detritus along a rock jetty close to the parking lot. The seaweed is yellow and brown and green and chopped by the waves into small mushy pieces, the edges crinkly like lasagna. The layer I set upon is a half-foot deep and flecked with all kinds of seaborne detritus, a Sargasso Sea at my feet. I turn the plastic tub on its side and scrape the briny mix into the bucket with a three-tined hand hoe. Caught up in the tidal ebb and flow are dismembered crab legs and carapices of baby horseshoe crabs. Shells of mussels, clams and oysters dot the mix, and in they go, too. The clattering seashells, which slowly break down into their basic components of lime and calcium, offset the acidic mulch of all the leaves in my pile. (I’ve also heard that seashells give tomatoes more flavor, and I flick stray shells from the seashore straight into the vegetable garden. Like tossing a penny into a fountain, I wish for tasty tomatoes next summer.) I always have to separate out a few bits of styrofoam or plastic — a broken fork, a bottle cap, snags of fishing line or deflated mylar shell of a helium party balloon, with string. I love bringing this bit of the beach back home with me. The bucket smells like part wet swimsuit, part low tide, and all pure summer. Seaweed gathered from the local beach is a rich stew of ready to rot greens. The town opens up its beaches to dogs on Oct. 1, and I bet I’ve made 10 trips back and forth since then. 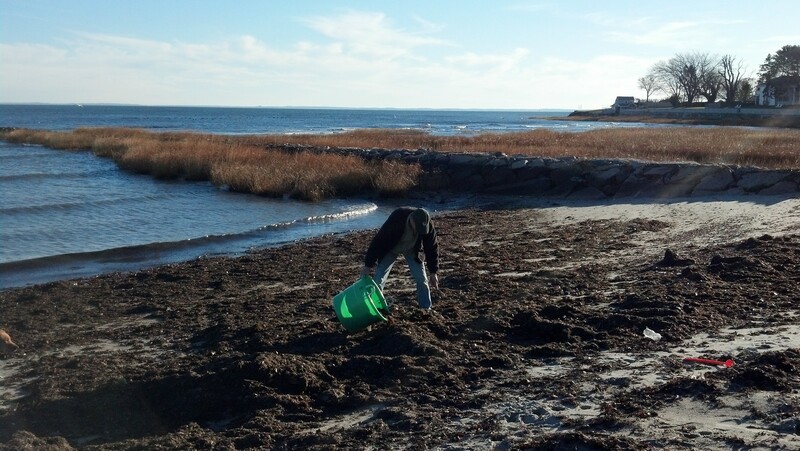 It’s always a good day when you are at the beach, and on most visits within an hour or so I can tire the dog out and fill up a keg-sized bucket with 30 or 40 pounds of fresh, ripe seaweed or, just as good, a lighter mix of salt marsh hay. My dog’s in great shape, and so is my pile. “A single type of seaweed could cut greenhouse gas emissions, fight ocean acidification, removed invasive species, restore fisheries, and help coastal economies around the world,” Kirby writes. I worry about the amount of methane, however negligible it may be in the greater scheme of things, my puny pile may fart out. So I take comfort in knowing that the seaweed I stuff into it may also be a solution to a far greater problem. Evidently, the seaweed contains a compound that helps disrupt enzymes used by gut bacteria to produce methane, which has up to 36 times the global warming potential of carbon dioxide. We may be only just now finding out how basically good seaweed is, in situ and on my pile, but this new reporting makes me appreciate it even more. Perenyi also cites salt hay as “a good source of trace minerals and decomposes without depleting the soil of nitrogen.” Added to my pile it also helps aerate the mixture of other rotting organic material, and any bucket of seaweed I haul home from the beach is usually suffused with the straw of salt marsh grass. Another inspiration for adding seaweed to my pile is The Field, a fine if unsettling film by Jim Sheridan, made from a stage play in 1990 with a stellar cast, starring Richard Harris, John Hurt, a young and menacing Sean Bean and Tom Berenger as the rich, handsome Ugly American. 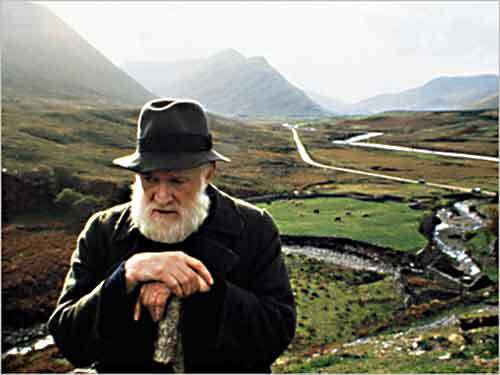 The title role is played, with convincing Irish charm, by an acre or two of lush green pasture enclosed by a rim of ancient stone walls. Bull, inhabited by Richard Harris, has tended the rented vale his entire life, turning it from barren ground to most productive pasturage, where he raises fresh hay and straw to feed his livestock for market. To Bull, his field is my pile a hundredfold. The movie begins with Harris and Bean, as his mulish son, collecting heaping strands of giant kelp fronds from a rocky beach, packing the lot into wide-mouth wicker baskets on their backs and schlepping the harvest of seaweed over hill and dale back to their Field. “It’s the best fertilizer in the world,” Harris adds as they dump their wicker backpacks atop a pile of seaweed-infused compost, an Irish version of my pile. If not to the same morbid end, I feel the same way about my pile. Seaweed adds a rich mix of nutrients and minerals to my pile.